Bits and bobs from us. Unless stated otherwise, all opinions expressed in the articles below are ours and we stand by them. For more information on anything please Get In Touch, we'd love to hear from you. That's it guys, we've reached a hundred machines! Having been at this since December 2014, it feels great to get to this milestone and it's fitting that machine number 100 is on its way to a very good customer of ours in London - They've had nineteen machines from us as of February 2019. Best get cracking on the next hundred. Update 30th Jan 2019 - The Mark Zen machine has been sold and is no longer available. ... And Another Machine For EDAC! Soon to be sent with the first machine to Munich, Germany as part of their trade display at the Electronica 2018 Trade Faire, this is the second custom machine made for EDAC. The trade faire takes place for a few days mid-November 2018, we'll have more information and some cool pictures from the show then! Want to know more? 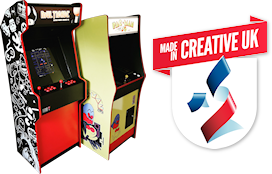 We offer Fully Customised Arcade Machines to businesses and individuals across the UK. Update 13th July 2018 - The AKIRA machine has been sold and is no longer available. After weeks of work, our new website is live! With details of our new ranges and machines, we've tried to create a more user friendly, informative experience. Get in touch for more details on anything you're interested in. Update 29th October 2018: You may have noticed a lot of ongoing changes since July as we're still working to update the website. Please keep ckeching back as we're always adding new designs and projects.